Looking for a Home Appraisal in the Houston Washington Ave Area? Our Texas certified appraisers are the leading providers of independent residential and commercial real estate appraisals in the Washington Avenue neighborhoods. We strive to provide an appraisal report that meets our clients’ expectations and is delivered with an industry leading turn time. We have some of the lowest appraisal fees in the area and take pride in delivering completed assignments faster than the average appraisers. All of our appraisers are Houston area natives and have over a decade of experience in the market area. We employ appraisers capable of performing all assignment including residential, commercial or mixed-use. For commercial projects we only assign Texas Certified General appraisers with a minimum of 10 years of experience in the Houston market. Additionally, our appraisers are able to provide valuation services for any use including financing, private situations, insurance, legal issues and any other scenario that requires an accurate and reliable property valuation. We are dedicated to delivering competent, friendly and expedient services to all our clients be it homeowners or industry pros. Should you have questions, or cannot find the precise service you need, you can use our website contact form or phone us directly at the number displayed on this page. 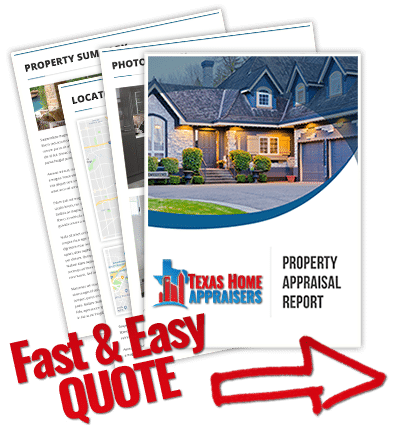 Do you need a local houston house appraisals today? Call us or fill out the web quote form and our staff assist you shortly. Why do home appraisals cost so much? Real estate appraisal is a highly regulated field with many fees, licensing, insurance, and continuing education costs that an appraiser pays annually to stay in compliance. Appraising real estate is actually very skilled work that is hard to do and requires hours of labor to complete a full appraisal. There are no “templates” and each property is unique plus it must be compared to the current market. This means that even if the appraiser has performed an appraisal on a similar home, he still must review all of the data within the present window of time to determine an accurate current value. Yes. The Equal Credit Opportunity Act (ECOA) requires creditors to automatically send a free copy of home appraisals and all other written valuations on the property after they are completed, regardless of whether credit is extended, denied, incomplete, or withdrawn. What documents will an appraiser generally need? In rare cases the appraiser may need documentation that only the client has access to, but for the typical appraisal there isn’t anything the appraiser should need to complete the report. If the appraisal is in relation to a sale, your appraiser will ask to see a copy of the sale agreement for the property. There may be certain aspects of the contract that could impact the appraisal value. Other helpful, though not necessary documentation would include: A property survey that shows all structures. Deeds or title docs which contain a legal description. For home sales, a list of personal property that will be included. A list of upgrades and improvements made in the last 5 years. A copy of the original plans & specifications is another items that is almost always helpful to an appraiser. Do appraisers use price per square foot?